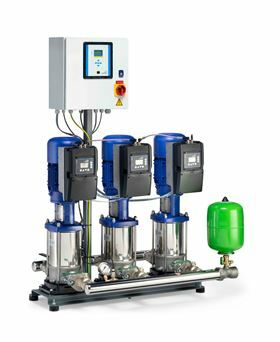 Among the products that the KSB Group are presenting at the ISH trade fair in March are its KSB Delta Primo type series pressure booster systems. The series has design variants K, VP and SVP, which each offer different features. The fully automatic systems are supplied ready-to-connect. They are equipped with either two or three Movitec centrifugal pumps. The maximum flow rate per system equals 67.5 m3/h, the highest head 134 m.
The Booster Control Advanced microprocessor control unit starts and stops the pumps using cascade control (variant K) or a frequency inverter for speed control (variants VP and SVP). With its field bus interface, the system can also be operated from an external PC. On the control cabinet display, LEDs indicate the operating status of the system. Should a duty pump fail, the control unit will immediately start up the next pump. For transmitting warnings or alerts to a higher-level control station two additional volt-free contacts on terminals are provided. The SVP variant is fitted with an IE5 synchronous reluctance motor from the KSB SuPremE type series and a PumpDrive Eco variable speed system. The K and VP variants come with IE3 motors. The KSB team will be at Hall 9.0, Stand A58. The valve series uses ultrasound waves and two sensors attached to the valve record the flow rate. The KSB Delta Solo will be launched at ISH 2019.